The story that goes with this is Parable: Elephant Training. The space shuttle Atlantis lifted off on Friday (July 8) for the final shuttle mission. It was overcast, so I understand it couldn’t be seen from Payne’s Prairie, south of Gainesville, as it sometimes can be. The space shuttle program ends with this mission. No more shuttles. I grew up on space dreams. It was the 1960s. The Apollo program was gearing up. 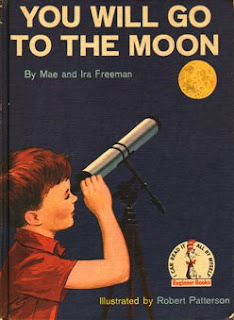 One of the beginner reader books that came in our children’s book club subscription was by Mae and Ira Freeman first published in 1959: You Will Go to the Moon. I was seven years old when the original series Star Trek first began airing, and William Shatner's voiceover echoed in my soul. Space, the final frontier. These are the voyages of the Starship Enterprise. Its continuing mission, to explore strange new worlds, to seek out new life and new civilizations. To boldly go where no one has gone before. At the close of the shuttle era, our sense of outer space and inner space is different from what it was at the beginning of the Apollo era. Interestingly the first moon landing, in 1969, and the first Earth Day were less than a year apart. At the time we were leaving our home planet, we were also beginning to honor and cherish this earth -- beginning to develop a new sense of how strongly "home" and "planet" go together. My own dreams of life on the moon, or on the Enterprise, or on a giant wagon-wheel-shaped space station, spinning so as to create artificial gravity, have subsided as an ecospirituality has deepened in me a connection to the beautiful and vast biodiversity here, and my need to be amidst it, right here on this blue boat home. E.O. Wilson argued in Biophilia [Wikipedia article is here; Amazon page is here] that we primates crave abundant and diverse life around us. He also noted that the species in a given eco-system are possible because of interactions at the edge of that system. Thus, no space station smaller than, say, Vermont could sustain the species diversity that our hearts and souls need to have around us. It would be great to visit space in the Enterprise, but I now know our spirits would whither if we had to live there. The frontier of outer space is a metaphor for the frontiers of inner space – journey outward, as it has been in mythic tales for centuries, represents the inward journey of discovery. The final frontier, then, is, indeed, space: as much inner space as outer. It is the voyage inward that I want to talk about today. Star Trek’s 60s vision of outer space included a parallel 60s vision of inner space. Creator Gene Roddenberry depicted the divided self -- reason vs. emotion, head vs. heart, intellect vs. passions, cognitive vs. affective – in two characters: the hyper-logical Mr. Spock, played by Leonard Nimoy, and the passionate, emotional Dr. McCoy, played by DeForrest Kelly. Mr. Spock –- and later the robot character, "Data" from Star Trek: The Next Generation -- supposedly don’t have emotion. But that’s a lie. An organism, whether human or Vulcan or robot, able to interact with others and pursue purposes cannot be without emotion. Mr. Spock and the robot ("android," for sticklers) Data clearly have values that guide their actions. Whatever it is that produces and maintains those values, that’s what emotion is. Recent research bears me out. Emotions, especially fear and anger, fire out of the amygdala and other parts of the limbic system, but an essential part of our complex emotionality is the processing done not in those old reptilian structures but in the new frontal cortex that has grown especially large in humans. The lower third of the prefrontal cortex, called the orbitofrontal cortex, is the most consistently active area of the brain during emotional reactions. When certain parts of the orbitofrontal cortex are damaged, patients lose most of their emotional lives. They don’t have the bodily reactions normal people have when observing horror or beauty. They feel nothing. Tests of reasoning and logic and intelligence and knowledge of social rules and moral principles show those functions are all intact. Mr. Spock took actions clearly based on wanting some outcomes and wanting to avoid others, so he clearly had to have emotions. I found it an annoying and obviously false pretense that he kept saying he didn’t. As far as I could see, the difference between Dr. McCoy and Mr. Spock was that McCoy did tend to be unnecessarily judgmental. Other than that, the difference was just that DeForrest Kelly was overacting and Leonard Nimoy was not. The emotion decides what it likes and doesn’t like, and reason goes to work figuring out how to get what it wants and avoid what it doesn’t. I want to give you two metaphors. First metaphor: Reason is like the rider on the elephant. Reason knows it has to take care of that elephant, so it watches what the elephant does to see what it wants, and tries to give it a little guidance so it get what it wants. Second metaphor: Reason is like your inner lawyer, following you around, watching what you do, making assumptions about what you seem to want, and offering advice about how to negotiate your complex social world. Your lawyer does two things: (1) defends you with arguments, explanations, and justifications; (2) advises you about how to behave so as to stay out of court, or have a stronger case if you do end up in court. A good lawyer thus guides the client to act confidently in complex legal terrain and keeps the client out of court, or facilitates going to court with a greater chance of winning. The thing is, in this case, you are constantly in court -- the court of public opinion and social assessment. We are constantly justifying and defending what we’re doing to others. And just as a defense lawyer constructs the best possible story about the defendant’s actions and motives, your reason tries to do that – even if the story has little connection with what the real motives were. Clients will sometimes hide crucial information from their lawyer, and our unconscious emotional processing is largely hidden from reason. Let me illustrate. Studies by psychologist Michael Gazzaniga showed how very divided left and right brain are. The left-brain controls language, so that’s no problem for the left brain. When Gazzaniga flashed the picture of a hat so only the right brain saw it, then asked, "What did you see?" subjects said, “Nothing.” The right brain doesn’t have language centers, so it doesn’t have any way to say what it saw. The talker over in the left brain says “I didn’t see anything” because the left brain didn’t see it. But we know the right brain did see it. We know this because the right brain controls the left hand. When Gazzaniga put out an array of pictures and instructed, “with your left hand, point to what you saw,” the left hand pointed to a hat. If he asked them to point with their right hand, they couldn't do it -- because the right hand is controlled by the left brain, and the left brain didn’t see anything. “It was as if a separate intelligence was trapped in the right hemisphere, its only output device the left hand.” (Jonathan Haidt, The Happiness Hypothesis, 2006, p. 8). Then Gazzaniga expands the experiment. He flashes two different images at the same time, one into the left brain and one into the right brain. The right brain sees a picture of snow covering a house and car. At the same instant, the left brain sees a picture of a chicken claw. Gazzaniga asks the subjects what they saw. The talker over on the left side is the only one that has anything to say, so subjects report, “I saw a chicken claw.” Instead of asking for words, Gazzaniga tries using the array of pictures. The right hand points to the picture the left brain saw at the same time the left hand points to the picture the right brain saw. Gazzaniga wanted to see if each brain could make a simple inference. So he asked each hand to point to a picture of something that goes with the picture seen. The left brain saw a chicken claw, so subjects' right hands pointed to a picture of a chicken. Chicken claw goes with chicken. The right brain saw a snow-covered house and car, so subjects' left hands pointed to a shovel. We might not know this in Florida, but people who do have snow in the winter know that when your house and car are covered in snow, you have to shovel it. So shovel logically does go with snow. "I have no idea why my left hand is pointing to a shovel. It must be something you showed my right brain." Instead, the left brain instantly made up a plausible story. The patient said, without any hesitation, "Oh, that’s easy. The chicken claw goes with the chicken, and you need a shovel to clean out the chicken shed." (Haidt 8). Your inner lawyer not only fabricates for you the best possible defense it can, given how little it knows about the true causes of your action, but your lawyer also advises and guides you so your next court appearance – which is always likely to be any minute – can go smoothly. Having made up the reason that you are getting up to get a Coke, your inner attorney will guide you actually retrieve a Coke, whether you really wanted one or not, because it’s going to have a hard time defending you if you don’t. So here’s our basic human problem: the elephant doesn’t always do what’s best for it. As any attorney will tell you, clients will do astonishingly foolish things. And the rider’s ability to control where the elephant goes, like a lawyer’s ability to control client behavior, is pretty limited. Your divided self is both elephant and rider together, both attorney and client together. To work well together, each side must cultivate the skills of listening very carefully to the other. After all, reason really would have no idea where it wanted to go if it weren’t for the emotions generating desires. So we’ve got elephants that are themselves divided into conflicting impulses and desires. The rider’s job is to try to work out which desires can be deferred for the sake of the long-term well-being of the elephant, and to try to guide the elephant that way. We know will-power alone isn’t how we can direct our lives. New year’s resolutions quickly fail. I dare say everyone in here knows the experience of deciding to break a bad habit, or to lose weight, or quit smoking, or get in shape, or spend more time reading the great literature – and you know how hard it is to get the elephant to go in the direction you want it to. You’ve got to work with the elephant: gently, patiently. We have to respect it and love it and honor it for itself. The lessons of highly-skilled animal trainers have much to teach us about guiding our own animal natures. Can we learn to be elephant-whisperers? You may have heard about the horse whisperer – the 1995 novel by Nicolas Evans and the 1998 film with Robert Redford. If you saw the movie, The Horse Whisperer, it looks like the retraining of the horse was a single session. Real horse trainers who use the natural horsemanship technique that horse whispering is based on know that it takes many sessions. (Frank Bell's natural horsemanship site is here.) Similarly, you don’t turn around the elephant of your life in one day. It becomes an ongoing life project of building and maintaining mutual understanding. This “whisperer” concept is widespread now: There’s a TV show called the dog whisperer about a dog trainer helping clients whose dogs have behavioral problems. In the 2005 action comedy called “The Pacifier,” Vin Diesel tries to escape from his captors by trying to communicate with a pet duck to help him escape. One of the villains sarcastically calls Vin Diesel, “duck whisperer.” I laughed. 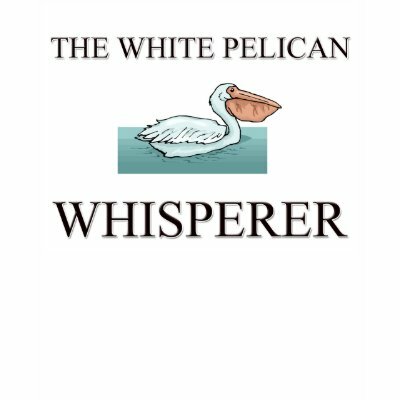 But then LoraKim told me about some time she spent working with a woman who actually is a pelican whisperer. T-shirts are available. The true natural horsemanship technique involves working with horses appealing to their instincts, especially their herd instincts. The trainer’s communication approach derives from wild horse observation in order to build a partnership that closely resembles the relationships that exist between horses. This “whisperer” approach will be very different from species to species, but the aim is always to relate and appeal to the animal's own inclinations rather than trying to overpower them. The lesson for us, as we aim to learn the art of Self Whispering, is to carefully observe our emotional self’s way of being “in the wild,” as it were – it’s natural and its instinctual orientation, its needs and tendencies. This is no an easy thing. It’s not uncommon for entire lives to be spent paying little deep attention to what’s going on in the emotional life – and having few skills for working with it. It is, however, a relatively easy thing to tell you what techniques do work for going inside to learn the elephant’s ways, so that the rider and elephant can together discern the path that will be joyful for both of them. Easy to tell you; though experience shows many people don't stick with them. Those techniques are: journaling, study, meditation, cognitive therapy, and, if further help is needed, SSRIs. Daily journaling trains the trainer to stop and notice and record what’s going on in our feelings so that we neither ignore it nor so quickly forget it. Daily study of wisdom literature teaches us some of the things to whisper to ourselves throughout our day. Daily meditation helps train the trainer to be not so attached to its own preconceptions of good and bad and where the elephant ought to go. And when the internal lines of affectionate communication and joyful collaboration just aren’t working, sometimes Selective Serotonin Re-uptake Inhibitors (SSRIs) – drugs like Prozac – can help open up those lines. There's a discipline here -- especially for those first three. And we know that elephant doesn't take to discipline very well. Your elephant is, however, a highly social species. So it really helps to have a group to get together with weekly to practice together: to talk about your journaling, to share reflections on wisdom literature you've read, and to share together 20 minutes of silence. You don't have to go it alone. You can't. If your elephant ain't happy, ain't nobody happy, and your elephant requires the encouragement it receives from practicing in a social context. We need friends along the path. These are the voyages of your starship enterprise: it’s continuing mission, to seek out new life and new relationship within yourself. To explore and to know. To come in peace, and build cooperation. To boldly go where you have not gone before. An earlier version was preached at the Unitarian Universalist Fellowship of Gainesville, 2011 July 10.